The Turkish EU Affairs Minister Egemen Bagis said in October 2012 that the “Turkey’s military power today is at the point where it could destroy Syria[‘s government] within a few hours”. Considering the Syrian death toll is almost at 40,000, and 120,000 syrian refugees have fled to Turkey, you’d expect the Turkish Army to have intervened by now and put an end to the horror and death happening in Syria. However the silence of the Turkish Army is deafening. The U.S.A is meddling in the affairs of Syria, preventing Muslim armies from coming to it’s aid, while busily ensuring that it’s agents and supporters are leading the Syrian opposition – using U.S.A supplied arms and funds – that will ensure a U.S. controlled government once the ‘opposition’ is victorious. As for the Israeli bombing and possible imminent land attack on the large open air prison for Palestinians (i.e. Gaza), instead of the Egyptian Army intervening, declaring Gaza an Egyptian protectorate, or at least deploying troops to make a show of strength and pressure Israel into backing down from a land invasion – Egypt has been demolishing smuggling tunnels at the Rafah crossing, cutting a major lifeline of desperately needed supplies into Gaza. And lastly, the sabre-rattling against Iran’s Nuclear program has illustrated the double standards of the Western powers, who are silent on the 200 Nuclear warheads in Israel – which has attacked more countries in the region then any other. It is clear that the U.S.A and EU do not want Muslims to develop their own advanced indigenous military technology and industry that would protect Muslim countries from invasion (Noam Chomsky has made the same observation). For all these we can conclude that the U.S.A and E.U do NOT want Muslims to solve their own problems, not in Libya, not in Palestine, and now, not in Syria. Instead they want Muslims to supplicate and beg the idol Barack Hubal-ma for help and succour; and the defeatist and weak-minded of the Muslims are more than obliging. If the Ummah but realised that we have the power and means to solve our own problems, and that we do not need the U.S.A for help, the Ummah could set up governments that represents their true aspirations of Islam and its political implementation i.e. Caliphate. The Muslim Ummah would then wake up to a world of independence, control over it’s destiny and liberation from exploitation, oppression and subjugation. This is something the U.S.A and EU does not want, and will do everything in their power to prevent. The descendants of the Ottomans and the descendants of the Mamluks now only compete with eachother in who can do nothing the most. It’s time the soldiers of the Muslim armies make a 180 degree turn and start pointing their weapons in the direction of their borders, rather than at their own civilians. The lines are drawn, and the battle for our future has already begun, one side is filled with the ranks of the defeatists, the silent, the supplicators to the West, and the collaborators. The other side fights with speaking the truth for justice, liberation and the revival of Islam and Caliphate, Which side will you join? “The grinding wheel of Islam is turning. So, turn with it” narrated to have been said by Prophet Muhammed (saaw). Great article brother Abdullah. Hoping to bring you down to Surrey campus soon. Just wondering though, wont it be extremly difficult to universaly elect a single Caliph for the entire Muslim population who is not disregarded by most of the sects and divisions we have these days? How would we go about this procedure? Thank you for the comment, and question. We would elect a Caliph in the same way the West elects a leader amongst its differing sects (e.g. conservative/Republican, socialist, Liberal/Democrat, Environmentalist, Neo-Conservative etc) – via elections. Once the leader is elected by the Ummah, he will become leader. The Caliph does not interfere in theological differences of opinion, so his furu’ al aqeedah would become irrelevant. Rather he would run the state based upon his adopted fiqh, which people would have to bey because he is the leader, and the ijma of the various sects is to obey the Islamic ruler whether you agree with his fiqh or not. Just like the West does with it’s ‘madhabs’. Look forward to seeing you in Surrey Inshallah, brother. You have a much more optimistic view than I of a Caliphal system, dear Shaikh, but I too would be elated if such a candidate who could carry out the affairs of state justly would be found. In order for that to happen, I reckon that as Muslims we need a lot of educating on classical orthodox Islam (incidentally I tend to lead toward a Shi’i conception of orthodoxy though I don’t believe that this is far-different from that which you propose, I imagine I would probably be very happy in such a state after hearing you speak on Shari’a, justice toward minorities etc., . .. wait, is that MI5 knocking on my door for saying that ;)) and that we need to critically engage with our texts again – a la tajdid or islah (Sh. 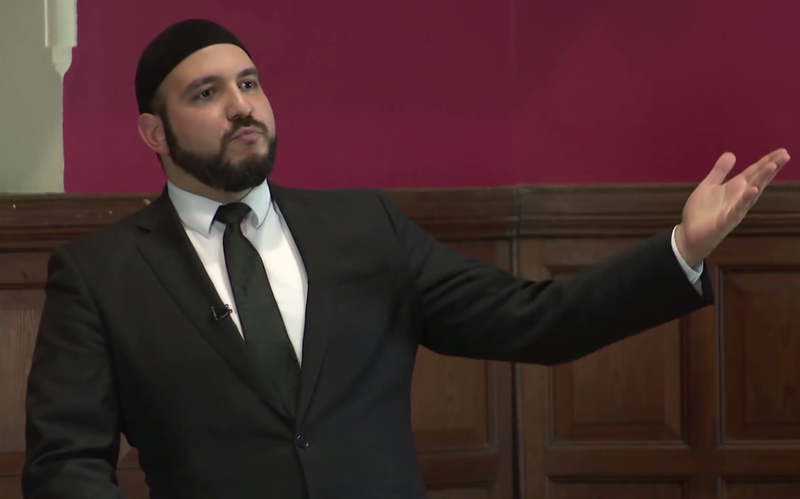 Hamza Yusuf’s and Prof. Tariq Ramadan’s talk at Oxford a couple of years ago I think was so far our best attempt as a community to express the need for critical engagement in the English language). As for your article – this was much enjoyed! I do also believe you have something of a more optimistic approach in terms of the Muslim Armies or for the ability of Muslims to engage with each other today, given the widespread emergence of militant extremists (even the ones no-longer apparently subservient to their colonial masters – a la Al-Qa’ida – though Lord Knows they’re playing pitch-perfectly into the hands of the Neocon Jingosists in the States and Israel). Given the widespread Wahhabi ideology across the Islamic world, I would posit that if there was a genuine Muslim army who came to the aid of the Syrians, the country would still fall prey to sectarianisms and a schismatic dichotomy – my fear would be that Ahmadi,Alawi, Ithna-Asheri, Ismai’ili, Baha’i, Maronite, Coptic etc communities might not foresee a place for themselves in such a Middle-East, or more specifically, such a Syria. As someone who has spent some time in Syria, and has a very soft spot for her people and various communities, I do despair that this so called ‘opposition’ will do more damage to the pan-Islamist project than good. Freedom cannot be wrought at the hands of weapons. Even when Mecca was ‘reconquered’, the Quraysh were granted clemency despite their crimes – a project based on humanity was built by our blessed Prophet – we will need this sort of civil-engagement with one another if we are to realise our aims; I’m not sure that our community (and as you can see, I’m not one for schismatic Islam and do believe in the ideals of an ‘Umma’, even though I have a bitter taste for the Wahhabi ideologues, admittedly) is prepared for it. Perhaps I should edit a little of what I said; ‘Wahhabi’ can be a rather derogatory term so I apologise for using it – no-doubt those who hold to its value system believe in it with utmost sincerity; rather the ideologues I’m not a fan of are those of a ‘takfiri’ mentality (again this might be an Orientalist designation so perhaps there’s a more apt term); I say this in reference to Syria and other places of civil strife, only because I know of many brothers and sisters who have had to flee their homes and countries (Afghanistan, Iraq, Syria) for just happening to belong to a ‘kafir’ sect – oddly enough I know of one Afghani family who had been living in the outskirts of Damascus for decades who have now had to flee to Iraq as a result of militant jihadists – who sadly decided to side with the Western-sponsored opposition – that made threats on their lives. That is not to say, of course, that others in Syria have been uprooted for simply holding a position that has nothing to do with sectarianism in Syria (as we see in Dera’a, Halab, Hama etc); I’m just at this point so disillusioned at any alternatives to the Ba’ath controlled Syria – which no-doubt was tyrannical and had power concentrated at the hands of a minority – already we are seeing Armenian Christians, the Druze and other minority groups caught up in what is a full-scale civil war. In their zeal to remove the concentration of power from the Alawi finally, I fear that our brothers might go to excessive lengths to ensure that minority groups can’t retake their positions again, which could potentially make life very untenable for all sorts of groups who find themselves either siding with Assad’s government or being anti-‘Islamist’ (how I don’t like that word!)…. As for your points on Iran (which of course can be accused of all sorts of crimes and has been in the past), I do think you are right. Though I don’t believe the authorities there have taken that final step toward arming themselves (and there is much about the political system there that I am not a fan of, though I think it was probably the closest thing to a ‘liberation theology’ we have seen in the Middle East in a postcolonial context, which seems to be playing itself out in South Lebanon though is increasingly less popular- Mawdudi and the Ikhwan/Egyptian efforts aside for other complicating reasons); I do think your position is sound – hypocrisy is rife unfortunately. As you say, Chomsky did put it very, very well. Though I would definitely oppose a nuclear-armed Iran, for ethical and philosophical reasons (as I would oppose a nuclear Saudi or Egypt) that it is just too far beyond the scope of human fallibility to be allowed to possess an indiscriminate killing force, I can understand why in the logic of Arab and Middle Eastern (and Iranian) governments, it would make sense to possess such a weapon as a deterrent to colonial invasion.